Home > Slider > Echoing Voicies and Alarming Questions! 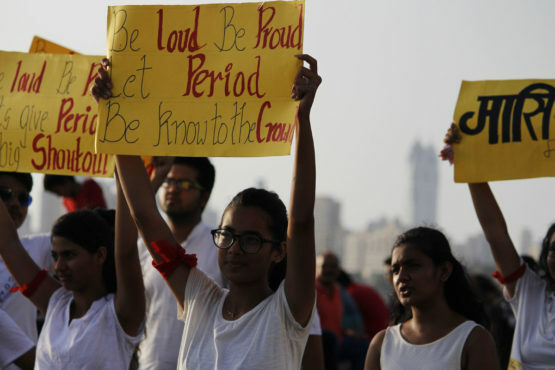 Echoing voices, nationwide campaigns and alarming questions have finally initiated a dialogue on the pressing issue of ‘healthy menstrual practices’. People have begun to talk about ‘periods’ and are striving hard to break the taboo associated with menstruation. In such a scenario, we thought it to be of utmost importance to promote not only healthy and hygienic menstrual practices through the use of sanitary napkins but to actually encourage women to make sustainable menstrual choices. Through our initiative of ‘Sustainable Menstruation’ we aim to encourage women to use menstrual cups and cloth pads rather than traditional sanitary napkins, to prevent menstrual flow. Sanitary Napkins contain plastic elements, which make it unsafe for our environment and society in the large run, thus making it an unsustainable choice. This initiative is aimed at both rural and urban women, between the age groups of 13-50 years. Our aim is to make these women realize that their choices regarding menstruation must not only be healthy and hygienic but essentially sustainable. Sweet site, super style and design, rattling clean and use friendly.